Whenever I hear a plaintive voice calling to me from nowhere, I always just assume it’s ghosts. 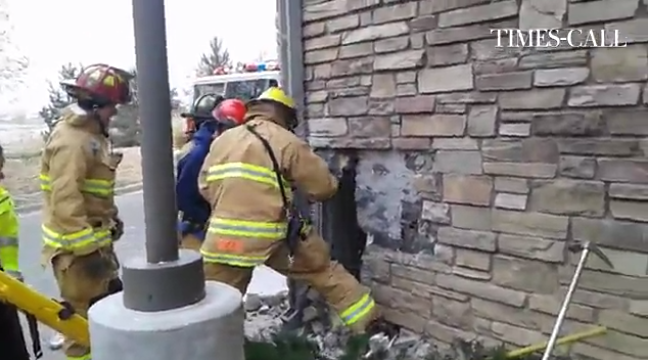 It’s a good thing I’m not a worker at Marshalls, where a man who was trapped inside the wall for up to three days was finally rescued after employees heard some odd noises. This, after the man apparently tried passing notes to the outside about his predicament. Officials tell The Longmont Times-Call that the fire department spent a half hour yesterday morning freeing the man from a vacant space between interior and exterior walls at the Marshall store, after what may have been an attempted burglary gone very awry. Employees said they’d heard a man yelling on Monday, but had no idea where he actually was. The next day they heard him again and figured out he was shouting through a hole in the wall, and sounded as if he was in pain. After police rescued him, they said he had tried to push notes reading things like “help” under the interior wall, but had failed. One was dated Nov. 8, leading officials to think he’d been in there since Saturday. “They were hard to read, but they definitely said ‘help,'” a police sergeant said, adding that one was written on his probation officer’s card. After he was freed from the wall he was taken to the hospital. Meanwhile the incident is being investigated as a possible burglary or trespassing, with charges pending, police said. It appears he fell about 20 feet after entering the building somehow through the roof, possibly by way of a vent.